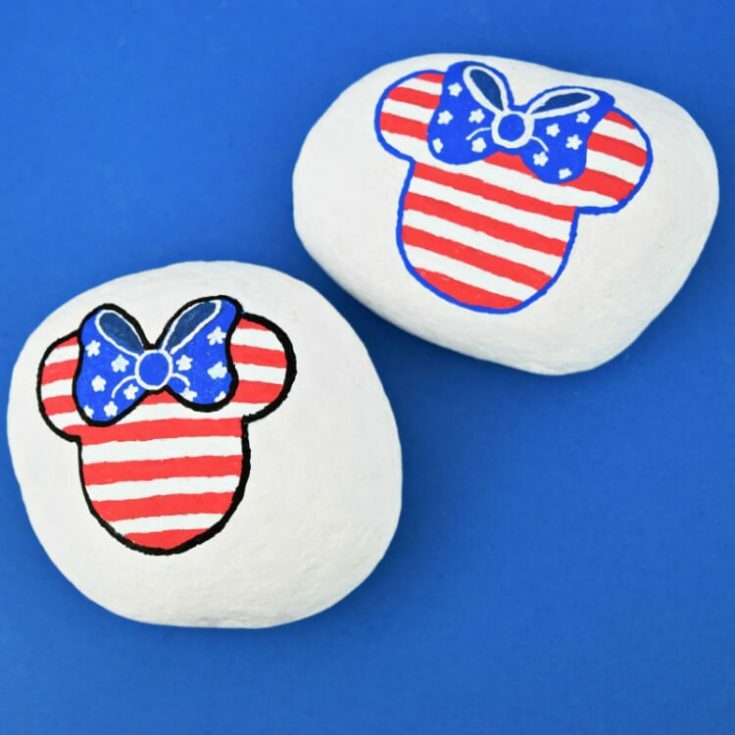 This patriotic Minnie Mouse rock painting idea comes from the kiddos! We were talking about flags and an idea was born – let’s paint a Minnie Mouse American flag rock. So we did. Click through to learn how to do it, too. The little one and I were spending some time painting rocks before swim lessons this morning. I mentioned I’d like to paint an American flag rock for Independence Day and the 6-year-old decided that just wasn’t her jam. She did, however, pose a solution: let’s make a patriotic Minnie Mouse rock! I showed her how to draw a Minnie Mouse, told her there were 13 stripes on a flag, and set her loose. While she painted, so did I. Let’s get started making this patriotic Minnie Mouse rock! We love easy rock painting ideas for kids here on Ruffles and Rain Boots. You don’t NEED paint pens for this Disney rock painting idea, but it will make it easier. There’s just something about these pens which help steady my hand. 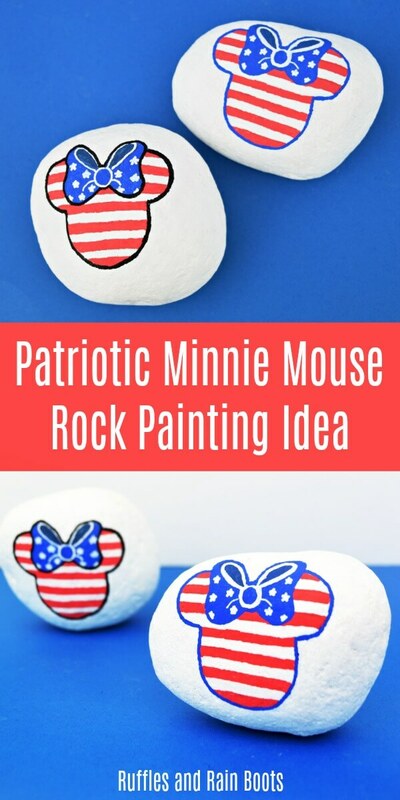 This patriotic Minnie Mouse rock painting idea comes from the kiddos! We were talking about flags and an idea was born - let's paint a Minnie Mouse American flag rock. So we did. Start with a base-coated rock - we used white on a Caribbean beach pebble (read about our stone choices for rock painting). Sketch or trace a Minnie Mouse. I made mine as large as would fit 13 stripes (just barely) using the eighth of an inch marks on the tape ruler. Add a large bow in the center. Using the red paint pen, color every other stripe starting with red. We're going to give that a second to dry. Use the blue and black paint pens to shade a darker bow section at the top (the inside loops). To do this, first, add a little blue and then a couple of dots of black. Blend with a paintbrush or your finger. Then, color the rest of the bow with blue. Leave it to dry while you use the white paint pen to fill in the stripes between the red. It's time to finish the bow. Add five small dots for the stars - I'm using a fine paint pen. Next up, outline the bow in white. 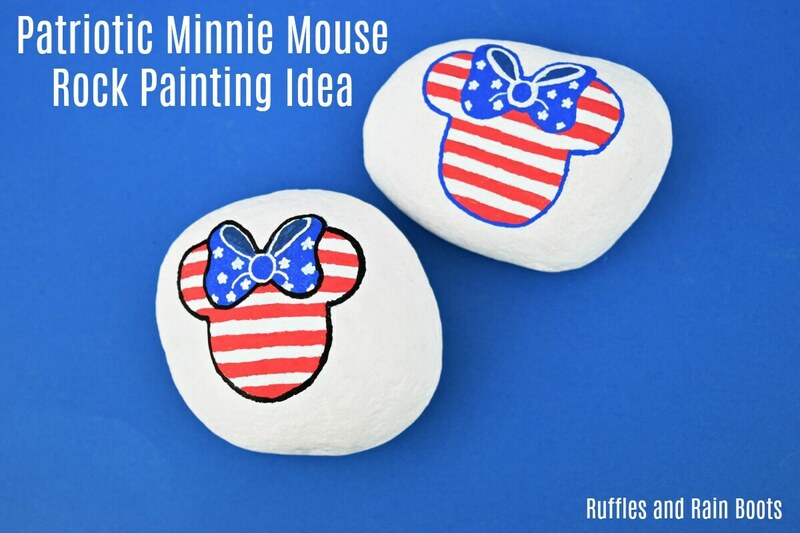 Finally, use blue or black to outline your 4th of July inspired patriotic Minnie Mouse rock. Seal it and hide, gift, or display. This is a ridiculously easy and fun rock painting idea, so it’ll be fun to share!